Product prices and availability are accurate as of 2019-04-06 18:15:26 EDT and are subject to change. Any price and availability information displayed on http://www.amazon.com/ at the time of purchase will apply to the purchase of this product. 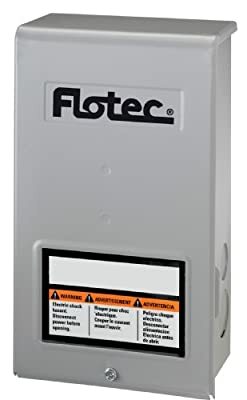 Flotec, Parts2O, Pentek Well Pump Control Box, Series: FP217, Heavy Duty, Submersible, 230 V, 60 Hz, 1 hp, 3 Wires, NO 4 Maximum Wire, Multiple-Size Electrical Knockouts, NEMA 3R Enclosure, Wall Mounting, Standards: UL 778 and CUL Recognized (60 Hz), Fits Pump : 8P4C02S, Induction Run (CSIR) and Capacitor Start / Capacitor Run (CSCR) Applications. For use with 3-wire 4" submersibles. Significantly reduces power consumption. Saving electrical usage translates directly to cooler motor temperatures, resulting in longer motor life. Contains starting components in an easy-to install and service design. 230V. UL listed.